Plantation Shutters Borehamwood by Just Shutters. Shutters are the perfect way to make the most of the light in your room. Just Shutters have an unrivalled reputation and are proud to introduce your local shutter specialist Tom Parrott – 01727 221298. Plantation shutters, sometimes called ‘shutter blinds’, are a hard wearing, versatile window covering that offer unsurpassed practicality and style. While shutters are so easy to maintain and clean, offering allergen and noise reduction and a fantastic range of other practical benefits, shutters are usually chosen with the heart not the mind. Why? Because they are simply beautiful and can make small rooms airy and bright – and make bold stylish statements in larger rooms. 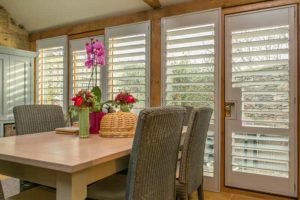 We offer the largest selection of interior shutters in the UK, For an inspiring gallery of images please see our shutter pictures, we hope these will enable you to envisage our wonderful shutters in your home. We also offer a free colour brochure with further information and guides. Just Shutters make the process simple, we do not hard sell, we believe our customers know better than anyone their requirements, we simply offer information and inspiration at our initial home visit, followed by the Just Shutters expert support throughout the purchase, installation and long, long after. Tom Parrott is your local shutter expert with decades of experience in his family shutter business, he brings expert service and quality to Hertfordshire homes and businesses. For further information on Plantation Shutters Borehamwood please book an appointment now, call us on 01727 221298 or request a brochure. For more inspiration please browse our stunning shutter images. We are incredibly proud of the frequent positive feedback we receive from our customers, below is a list of testimonials. To read more of our 1600+ national reviews visit our checkatrade page. Installation of new plantation shutters.